Web Desk (December 13, 2018): A 102-year-old great-grandmother is believed to have become the world’s oldest skydiver after plunging 14,000 feet (4,300 metres) through the South Australian sky. Centenarian adrenaline junkie Irene O´Shea said she “felt normal” after a 220 kilometre per hour (140 mph) dive that sent her cheeks flapping wildly. 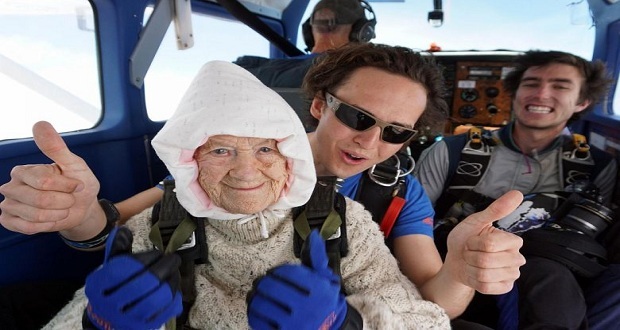 She completed her first skydive to mark her 100th birthday in 2016, but organisers claimed it was Sunday´s successful tandem dive at the age of 102 years and 194 days that earned her a place in the history books. “It was very clear up there, and the weather was good but it was very cold,” said O´Shea, according to Australian media. O´Shea took the plunge to raise funds for a motor neurone disease charity, after her daughter died from the illness.